For decades, sports at San Quentin involving outside community members have been separate recreational programs. Now two incarcerated men have a vision to unite the platforms under one banner – the San Quentin Athletic Association – to get sports recognized as more than a game. 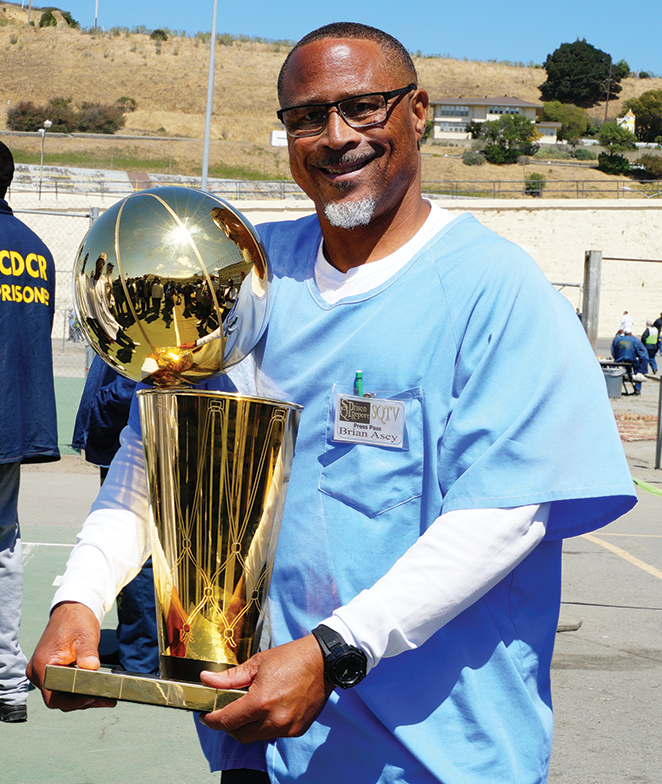 “We’re trying to get organized sports recognized by California Department of Corrections and Rehabilitation as a rehabilitative program because we have a lot of examples of people whose lives were changed by sports,” San Quentin Athletic Association (SQAA) founder Brian Asey said. The administration fully supports the sports programs at San Quentin. Over 40 teams were cleared to play baseball at San Quentin this year alone, according to SQAA co-founder Branden Riddel-Terrell. While CDCR awards time off a person’s sentence for taking certain programs, playing organized sports isn’t counted as a program that can earn good-time credits. Riddel-Terrell and Asey seek to take the necessary steps for sports to have recognition as a rehabilitation program. “In order to do that we need bylaws and structure,” Asey said. The SQAA structure includes representative from each sport. In the sports program at San Quentin on any given weekend between March-Nov. people from the community venture onto the Lower Yard to play basketball, baseball, tennis, soccer or flag football, softball or run track. Sometimes former pro athletics are among the visitors like former Oakland Raider Quarterback Andrew Walters. Actor Casey Affleck has played baseball twice at San Quentin. Plus NBA All-stars Draymond Green and Kevin Durant visited as well for the annual game against the Golden State Warriors staff that has included playing against former NBA pros turned coaches. Many SQ athletes report that interacting with the community while still in prison makes them feel like part of society and aids in their rehabilitation. The idea for SQAA started with a conversation between Asey and Riddel-Terrell on the pitcher’s mound about how the various sports activities on the yard could be improved. Both believe sports has a potential beyond just hanging out with awesome people. The two came up with the concept of creating the SQAA with a focus on sports’ rehabilitative aspects, something they both believe in. Asey, who’s 52-years old, played for the SQ Kings before retiring and taking on the role of general manager of the SQ basketball program. He has completed several self-help groups and is currently pursuing his associates degree while filming videos for SQTV, including a documentary called, “Growing Up Behind Bars”. Riddel-Terrell is also a college student and a mentor for a program that teaches social justice called, Coalition for Justice. By day he’s in the building maintance program. Riddel-Terrell, who also plays for both the San Quentin A’s baseball team and the All-Madden Flag Football, believes creating a structure for the sports program will bring it more attention as a whole but it’s not about controlling the teams. “We don’t dictate what teams do; we’re just here to support,” Riddel-Terrell said. SQAA could bring balance to programs that need more support than others. He said baseball cleared over 400 people to play on the Field of Dreams in 2018 while All-Madden cleared 12 for flag football. Asey and Riddel-Terrell see uniting the programs as a way to get more support for the programs that don’t have as many volunteers. Already, Kevin Rumon, a coach for the 1000 Mile Running Club at SQ, has helped out the baseball program by escorting teams in, that otherwise would not have entered the prison without a sponsor cleared by the administration. Several sports sponsors are also on board including Mike Krammer (Baseball Director); Frank Ruona (1000 Mile Running Club), Teohn Conner (Basketball program) and Andrew Crawford (soccer), according to Riddel-Terrell. The SQAA’s long term vision is to see a student athletic program with the Prison University Project, which provides an in classroom college education to the men at San Quentin. While they are still here, they hope to have the whole yard redone. “We’re trying to get the basketball court get done, the whole track, grass, the tennis court — everything,” Asey said. Both agree that donations can help but donating time is what the SQAA needs most. “We need volunteers, sponsors, people that could spread the word and invest their time or some form of donation,” Riddel-Terrell said. To volunteer to be a sponsor for the sports programs at San Quentin email Coach K. Bhatt at kuntal.bhatt@cdcr.ca.gov.